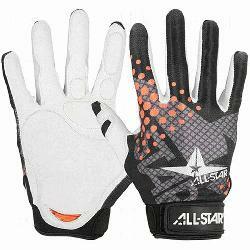 ALL-STAR CG5000A D30 Adult Protective Inner Glove (Large, Left Hand) : All-Star CG5000A D30 Adult Protective Inner Glove is designed for both catching and fielding. Lightweight and thin D30 palm and finger pads absorb and spread shock over a larger surface area. Limiting the amount of nerve damage in the hand after repeated hard balls. Padding extends all the way to the wrist for those wild bad hops and all the way up through the index finer. Extra padding on side wrist bone. Palm of hand is constructed with white goat skin leather and the back is a seamless moisture wicking stretch back. Adult intramural baseball - catcher - Tried a few gloves and this one stands above the rest. A little stiff at first so first impression was not positive but wouldn't catch without it now. Padding is good but don't expect miracles. 1st year back to baseball in 20 years and just took some time to adjust catching the ball in the right spot but the occasional hit it the palm this knocks the edge off the pain. It's not a miracle worker. The pads in the glove are hard and not all that thick. Feels like you're covering your hand with pieces of cardboard. 13 year old son is a catcher and after 2 broken thumbs, we invested in this beauty and he loves it. My son loves it. It somehow boosted his confidence on catching the ball. I recommended it to my other catcher and he also loves it. I highly recommend it. love it. just need my son to stop losing it. LOL He swears by it. he hates not having it. Second time purchasing these. The first pair lasted a few years.